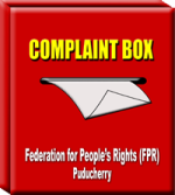 Book Release: “Beyond Violence and Non-Violence” by Dr.K.Balagopal – Federation for People's Rights (FPR), Puducherry. The Peoples Union for Human Rights (PUHR) and Federation for People’s Rights (FPR) released a book ” Beyond Violence and Non-Violence” written by Dr. K. Balagopal, on 30.10.2009 at Book Point, Chennai, in the Condolence Meeting. Professor A. Marx compiled and translated the book. Dr. K. Balagopal’s interview and his article published in Economic and Political Weekly regarding Violence and Non-Violence are translated and published in Tamil. The views on Violence of Dr. K. Balagopal, an activist who created deep path way on Human Rights is covered in this book. Human Rights Activists should follow the way of Non-Violence. 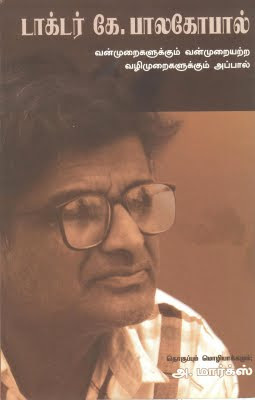 In the book Dr. K. Balagopal presses the way of Non-Violence and also his deep view on Violence. The view of Dr. K. Balagopal is now in debate all over the India. Triplicane, Chennai – 600 005. Adayar, chennai – 600 020. Please ask all the members of PUHR to join “K.Balagopal” group on facebook and exchange views, events of human rights violations etc. I like to buy 10 (ten) copies of the book ”Beyond Violence and Non-Violence” written by Dr. K. Balagopal.